The current anime summer season is rather slow for me. There are just some few shows I’m following at the moment and practically none especially enthusiastic, but this gave and still gives me enough free time to finally play through the Tsukihime franchise I could collect over the past one and a half year (later was’nt an easy task for sure if one can’t/don’t want to spend too much money on this). In the end I got Tsukihime, Tsukihime Plus-Disk, Kagetsu Tohya and Melty Blood ReAct, which hopefully are all Tsukihime games one can collect as for today (at least these are the ones I’ve found English patches for, many thanks to MirrorMoon and Beast’s Lair by the way). So far I’m through the first three games and I’m sure impressed by them. Each arc is touching on its own, but the later ones about the Tohno family are really great. This lets me understand now why so many people were rather disappointed about the anime that followed mostly Arcueids arc (but with the practical non-existence of the “main” heroine Arcueid in the later arcs there was not so much choice for the producers I guess). Of course, being an eroge, each heroine falls for the protagonist and finds a way to get laid, but that’s just a small cliché price to pay, doesn’t take very much time within whole story and with the patches comes the nice option to turn this sexual content off if desired. 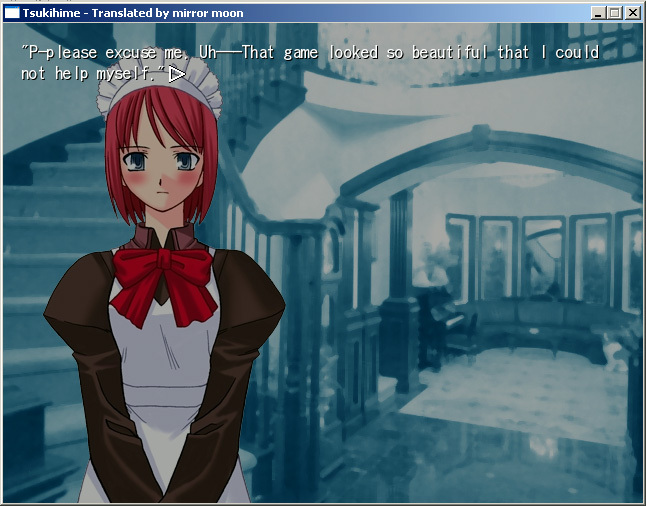 Finally, after the mostly serious Tsukihime the parodic Plus-Disk, the half-parodic Kagetsu Tohya and the translators (in some easter-eggs) twist a lot with the tragedy-loaded characters which is really a lot of fun to read and watch. For the obligatory rating, I’d said Hisui > Ciel > Arcueid > Kohaku > Akiha, whereat Ciel scored many points later in the parodic games through her constantly breaking of the fourth wall whining about the popularity polls she lost and how the budget for her got cut short because nobody would care. …okay, maybe I wasn’t even decent, but at least I had made my own soundtrack CD to which losing didn’t felt that, uh, humiliating. You are currently browsing the archives for the Tsukihime category.